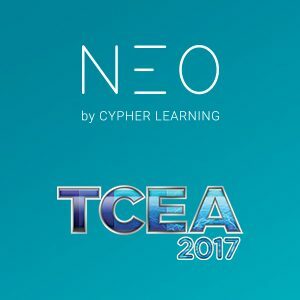 NEO, the LMS for schools and universities from CYPHER LEARNING, will be exhibiting at TCEA Annual Convention & Exposition in Austin, Texas between February 6-February 10. Attendants can visit NEO in the expo hall at Booth #1818 where the NEO team will be ready to provide live demos and answer any questions regarding the product, educational technology, and 21st century learning. TCEA’s 37th annual convention will showcase hundreds of sessions to choose from for every educator to discover new ways to engage students and enhance learning. There will be more than 900 sessions over the 5 days of convention, 450 exhibitors and an impressive list of attendees: district and campus administrators, curriculum and instructional leaders, classroom teachers, technology leadership, and more. To schedule a demo or get more details regarding NEO, please contact Patrick Verda, the Director of Sales for North America at patrick@cypherlearning.com. For press related inquiries, please contact the Marketing Department at marketing@cypherlearning.com.